Harbour View Cottage01525 405494work Self-cateringA warm & inviting fisherman's cottage only moments form the Wells Harbour quay side, sands and town amenities, good pubs and restaurants, all you need to enjoy a relaxing holiday in north Norfolk. Our charming 300 year old cottage reveals its history - some of the beams are masts of old fishing boats. The three storey cottage sleeps four people in one double and one twin bedded room (2'6" beds); there are views over the Harbour, creeks and marshes from the master bedroom which also has an en-suite toilet. The fully fitted kitchen has a washing machine and dishwasher. Bed linen is included in the price as is central heating, water and electricity; we will also provide you with a complimentary welcome pack at the start of your holiday. There is non allocated parking near the cottage with public parking only moments away. 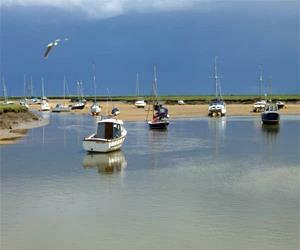 Wells is a vibrant working fishing port and the Harbour has increasing numbers of pleasure boats. We recommend the seal trips, but there is plenty to do, walking crabbing, bird watching, playing on the beach, with many tourist attractions in the surrounding area. The cottage has winding stairs and is therefore not suitable for people with mobility issues or very young children. No pets and non smokers only please. Visit our website for more information http://cottageinwells.tripod.com, including current prices and availability. A warm & inviting fisherman's cottage only moments form the Wells Harbour quay side, sands and town amenities, good pubs and restaurants, all you need to enjoy a relaxing holiday in north Norfolk. Our charming 300 year old cottage reveals its history - some of the beams are masts of old fishing boats. We hope you love the cottage as much as we do. Children's videos/DVDs available. No smoking. Suitable for families, groups, single travellers, allergy sufferers, business travellers. Children welcome from age 5. From Cromer or Hunstanton take the A148 to Wells. From Fakenham take the B1105 to Wells. When in Wells take the signs to the harbour, our car park is behind the Chandlery on the Junction of Standard Road and East Quay. If you are facing the sea the Cottage is at the right hand end of the harbour. The nearest mainline railway is in King Lynn or Norwich - approx 25 miles away.